You know Acer’s new Predator 17X is a big, bold gaming gaming laptop once you hit the power button. 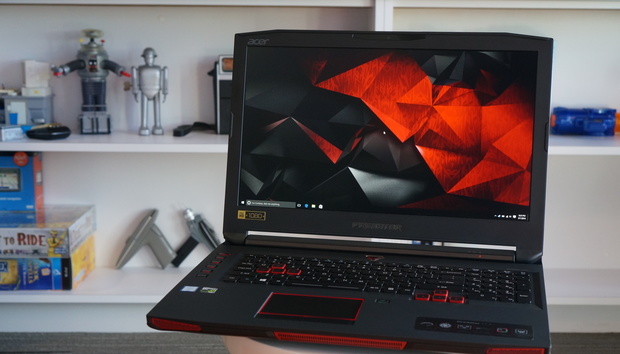 This laptop is the big brother to the Predator 17 that we reviewed in June, but despite the similar looks, it shouldn’t be confused with its sibling. While the Predator 17 rocked a standard Nvidia GeForce GTX 980M GPU, the Predator 17X packs the laptop version of the GeForce GTX 980 part. It basically offers 1:1 performance with its desktop counterpart—the, uhh, desktop GeForce GTX 980. The Predator 17 (top) and the Predator 17X (bottom) share similar lineage, but the 17X is slightly thicker and much quieter. One problem we had with the smaller Predator 17 was incessant fan whine, even under what we considered light loads. (Acer even released an update to address this fan noise issue.) Despite the more powerful GPU, we found the Predator 17X to be surprisingly quiet. That doesn’t mean silent, but the fan noise is very acceptable, even while gaming or running a FurMark stress test for an extended period of time. In fact, we played hours and hours of VR games using the Predator 17X, and whenever it wasn’t my turn, I hardly noticed the laptop was there. I barely noticed any noise when the 17X got stuffed into a backpack for a DIY VR backpack setup, either, so kudos to Acer. Here’s the heat dispersion on the Acer Predator 17X’s keyboard after running an hour-long graphics stress test. Paired with the GTX 980 is a quad-core Core i7-6820HK chip. That’s an unlocked 6th-gen Skylake CPU, with a stock clock of 2.7GHz and a Turbo Boost of 3.6GHz. Out of the box, the i7-6820HK is set to stock, but a preset profile lets you overclock the CPU to 4GHz and bump the GPU by 135MHz. I’ll cover that more in the performance section below, but I will say for now that I had no stability issues or screen artifacts running on turbo. The machine did get louder, however. The Acer Predator 17X includes a preset profile that bumps the CPU to 4GHz on all cores and overclocks the GPU by 135MHz. Elsewhere in the Predator 17X, you’ll find two Samsung M.2 SSDs in RAID 0, a 1TB HGST 2.5-inch hard drive, and G-Sync support for the 1920x1080 17.3-inch IPS screen. And like many other gaming laptop companies, Acer goes overboard on system RAM, stuffing 32GB of DDR4/2133 into the 17X when 16GB would be fine for most people. The M.2 drives are SATA rather than PCIe, which is a little bit of a bummer. Crystal Disk Mark 5.02 put the sequential, high-queue depth rate at 1GBps reads and about 600MBps writes. Not bad, but a single PCIe drive could do the same. The IPS screen features a light anti-glare finish. I measured the max brightness of the screen at just over 300 nits, which is pretty standard for a laptop. If 1080p isn’t enough pixels for you, Acer also offers the option of a G-Sync 4K panel. The audio subsystem features two 2-watt speakers and a subwoofer. They get decently loud with fair midrange, but they tend to rattle when cranked up to maximum. Don’t worry: They’re still suitably loud to annoy your roommates. Wireless is left to a Killer wireless card sporting Bluetooth 4.1 and 802.11ac with a 2x2 MIMO antenna. The battery subsystem is a massive 90 watt-hour tank...which gives you maybe an hour when playing a game. (You’ll want to keep the massive 330W power brick handy.) You can expect better battery life when watching a movie, but the truth is, heavy-duty gaming laptops rarely leave the grid. For ports, the left side has a pair of USB 3.0 Type A ports, 1/8-inch analog in, 1/8-inch analog out, and an SD card reader. The left side of the Predator 17X gives you two USB 3.0 Type A ports, two analog audio ports, and an SD Card reader. The other side of the Predator 17X features two more USB 3.0 Type A ports, full-sized DisplayPort and HDMI, gigabit ethernet, a Kensington lock port, and a USB Type C port that supports Thunderbolt 3. The right side gives you a gigabit ethernet jack, full-sized DisplayPort and HDMI, two USB 3.0 Type A ports, and a Thunderbolt 3 port. The keyboard is pretty typical for a gaming laptop: It’s full-sized with a standard layout. The keys felt solid with no give, and are backlit. You can change the color of the backlighting, but it’s zone lighting rather than adjustable per-key. As a result, the keyboard just isn’t as pretty as that of the Razer Blade 2016, which is simply lovely with its individually tweakable colors. The Predator 17X’s keyboard outlines the WASD keys in a garish red. The trackpad is suitably large, and had no issues during use. Overall, it felt firm, but with no click, and it has a slight texture. I like the handy “off” switch just to the right of it—this lets you switch off the trackpad when using a mouse, so that you don’t ruin your gaming session with an errant touch. Too close for missiles, switching to guns. When you flip both the Predator 17 and the Predator 17X over, you can see the subwoofers in red and the large feet that lift up the laptop and clear the air intakes. However, the Predator 17X’s door is quite a bit smaller, so you don’t get as much access to hardware. The access port for the Predator 17X (right) is smaller than that of the Predator 17 (left). Popping open the door lets you get at the slots for additional RAM, the SSDs, and the hard drive. If you’re wondering where the existing RAM is, well, that’s a good question. It’s probably under the keyboard, or maybe buried somewhere else—but in either case, good luck getting to it easily. You can’t access the GPU or CPU, but that’s fine, since messing with those would void your warranty. For most people, this amount of access is safer. If you open the bottom panel, you can drop in more RAM and gain access to M.2 SATA SSDs and the hard drive. None of these details matter without solid performance to make it all worthwhile, so I decided to see how the Predator 17X stacks up against a crowd of truly beefy gaming laptops. For reference, I also threw in the far-smaller Razer Blade 2016, so you can see what the GeForce GTX 970M gives you. First up is 3DMark Fire Strike Extreme. It’s a synthetic graphics test, but still a very viable tool for measuring overall gaming prowess. I ran the Predator 17X at its stock speed and using Acer’s preset profile for overclocking, which (as I mentioned earlier) overclocks all of the CPU’s cores to 4GHz and also boosts the GTX 980 by another 135MHz. At stock speeds, you can see the 17X keeps parity with comparable stock GTX 980 laptops—and yes, it’s the same speed as a desktop GeForce GTX 980 card. You can also see that it outpaces the GeForce GTX 980M laptops, too. When overclocked though, the Predator 17X gets a serious boost. It’s only slower than the even-larger Origin EON 17-SLX with its overclocked desktop CPU and GPU. The Predator 17X stacks up nicely against the crowd on stock. When overclocked, it’s a beast. Moving on to an actual game, we can see the Predator 17X comes in just a little faster than the MSI GT72S Dragon with its GTX 980. And when overclocked to 4GHz, the Predator 17X gives even the Origin EON17-SLX a good run by matching its score. The Predator 17X hangs tough in Tomb Raider. To see how the 17X handles a more modern game, I ran Middle-earth: Shadows of Mordor at 1920x1080 set to Ultra and with the 4K texture pack installed. The Predator 17X is just a tad behind MSI’s comparable GT72S Dragon at stock speeds, which was unexpected. Even overclocked, it’s basically dead even with the Dragon. I’d dig in further, but I unfortunately no longer have the MSI unit here. The Predator 17X is slightly slower than the GT72S Dragon in Middle-earth and just matches it even when overclocked. Our last test involves encoding a 30GB MKV file to a smaller MP4 using Handbrake 0.9.9’s Android Tablet preset. The test is heavily multithreaded, and can torture weaker machines. The 17X’s performance falls in line with what I’d expect for this series of CPUs. The Core i7-6820HK is maybe 100MHz faster than the Core i7-6700HQ, which isn’t enough to matter much in this particular test. Overclocking the 17X to 4GHz does amp up encoding performance, though. As expected, that beefy Origin EON17-SLX with its desktop chip buzzing along at 4.5GHz runs ahead of the crowd. The Predator 17X falls right where you expect it to in this CPU-intensive test. Overall, I’m pretty pleased with the Predator 17X. It hangs right with the competition in performance and its easy-peasy 4GHz overclock ramps up performance nicely. Its fan acoustics are downright impressive, too. At stock speeds, this laptop doesn’t get annoyingly loud, and only with the CPU and GPU overclocked do the fans become noticeable. I can’t say the same for the Predator 17, which was loud under most loads. The 17X is also competitive in terms of value. Acer’s suggested price is $2,800, but you can find the configuration I reviewed for $2,699 on Amazon. That’s actually a little less than comparable laptops. The only real problem the Predator 17X faces is timing. Newer GPUs from Nvidia and AMD are undoubtedly on their way, and few will want to buy aging technology when new hardware is around the corner. To be fair though, no one knows how that new technology will perform and when it’ll even be available for sale. So is one laptop in hand better than two in the bush? That's a question only you can answer, but I can say this: After spending many hours with the Predator 17X, it’s a fast, capable laptop that’s shockingly quiet. If Acer were to drop a next-gen GPU in it, it’d have the chops to be a lasting competitor. Turn on the Predator 17X and you’ll get an alien shriek rather than a post beep.